Edna Jeanette “Mama Jack” Brooks went to her Heavenly home on Sunday, February 10, 2019, at the age of 91. She was born in Kingston, West Virginia to Levi Escan and Mona Irene Bullion. She graduate from Fayetteville High School, 1947, in Fayetteville, West Virginia. She married Albert Marion Brooks in 1948 and they had six children: four daughters, Sharon Pope (Jim), Brenda McFarland (Paul), Cynthia Brooks and Donna Whitaker (Richard); two sons, Allen Brooks (Holly) and Thomas Brooks (Patti); two sisters, Joyce King and Patricia Troutman; nine grandchildren; twelve great-grandchildren, and six great-great-grandchildren. She worked at the following places in Beaufort and Port Royal: Al’s Drive In, Jarvista Restaurant, Blue Channel, Ribaut Bowling Lanes, Magic Market Port Royal, and over 20 years at Harry’s Restaurant Bay Street. She is a member of Shell Point Baptist Church. She is preceded in death by her parents; ex-husband Al Brooks; two daughters, Cynthia Brooks and Brenda McFarland, and a sister, Joan Burdette. The family will receive friends from 10 until 11 o’clock Saturday morning, Saturday, March 2, 2019, at Copeland Funeral Service – One Copeland Drive. A memorial service will be held 11 o’clock Saturday morning, March 2, 2019, in the chapel of Copeland Funeral Service. Burial will follow in Beaufort Memorial Gardens. My deepest condolence to the Brooks family. Your mother was a wonderful lady. I enjoy her company when I went to Harry’s Restaurant over he years. She will be greatly missed. My prayers will be with you all during this sad times. May the Lord touch each of your hearts and comfort you. Our deepest sympathy goes out to the family of precious Jeanette. From the Hills of W.Va. and into Beaufort, this family has followed us because Al worked with my dad. 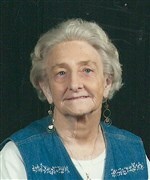 She was a wonderful Christian woman and a good mother and wife. She served her purpose on this earth and she is now with her Lord and Savior and we can all thank God that we will see her again.